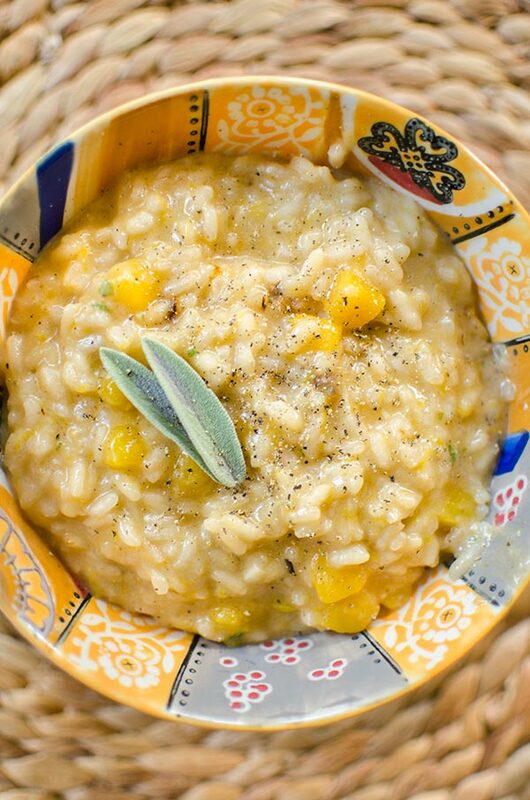 Celebrate the fall with a delicious and creamy butternut squash risotto with fresh sage. I love cooking with squash in the fall because it is so versatile. I have always found that squash is a little sweet for my palette, so I like to include it in dishes where it’s balanced out by something more bitter or acidic. While I wouldn’t consider risotto to be bitter or acidic, I find that the acidity from the white wine that gets added when you begin cooking the rice is the perfect balance for the squash. I also find cutting my squash into small cubes works well so that you have a little taste of squash in every bite, but it’s not just a bite with a big chunk of squash. This risotto cooks in the same way as a typical risotto, using the same technique as my mushroom and spinach risotto, but the butternut squash gets added at the same time as the onion so that it has time to cook. Some recipes will call for cooking the butternut squash first, but I found this technique works even better because the squash has time to caramelize in the butter. The sage, butter and parmesan get added at the end. When using fresh herbs in a dish, you typically will want to add them near the end because they are more delicate–dried herbs will hold up better to cooking over longer periods of time. If you are thinking about using dried sage in this recipe, I’d use about 1/2 a teaspoon, and add it at the same time as you add the white wine. But really, if you can get your hands on fresh sage that would 100% be the better option. In a large saute pan, add olive oil, butternut squash and onion. Cook 5 minutes, add garlic, cook another minute. Add arborio rice and salt, stir to coat and toast the rice. Add parmesan, butter and sage. Serve with freshly cracked pepper. 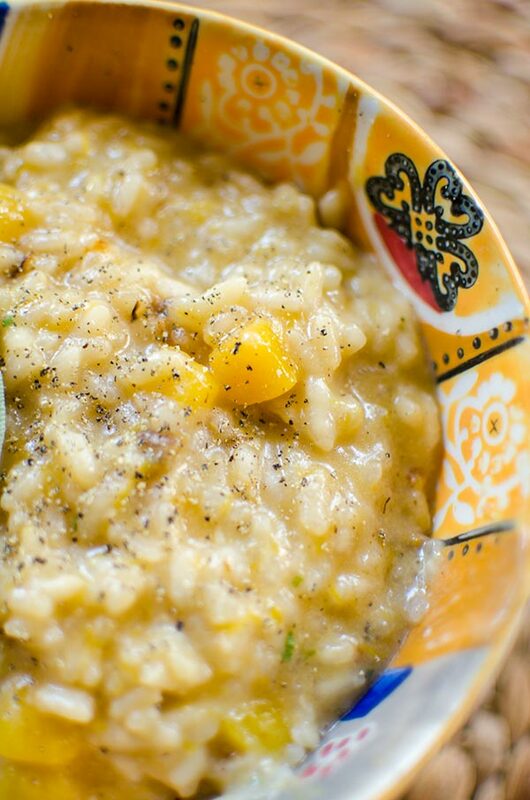 Let me know if you give this butternut squash risotto a try in the comments below.